In many ways Hondo feels a lot like Shane since it came out the same year and follows a wandering gunslinger who comes in contact with a frontier family. 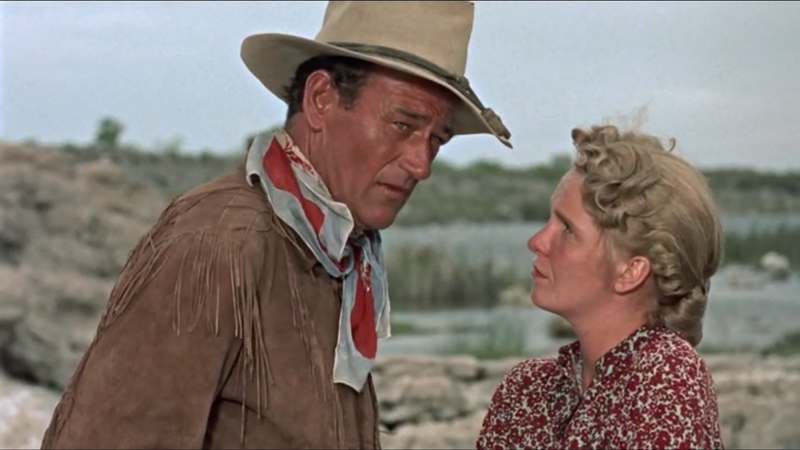 The story based off the novel by famed western writer Louis L’Amour is a lesser addition to the Western canon, but its hard to complain about a film with John Wayne. I was not a big fan of Geraldine Page (she seemed too needy) but I was happy to see some western mainstays in Ward Bond and a young James Arness. The film opens with homesteader Angela Lowe and her 6 year old son Johnny spotting a man off in the distance. At first they are tense but as he gets closer and they interact with Hondo, it is clear he only has the best intentions and needs assistance since he lost his horse. A great deal of the film revolves around the conflict between the native Apache and the U.S. Cavalry with Lowe and her son stuck in the middle of it all. Both sides seem to be at fault at times and in the right in others. Hondo used to be a scout for the Cavalry and he killed three men in the past year which raises the lady’s suspicions but she does not know the circumstances. When Hondo’s not having run-ins with the Apache or on the brink of being killed, he gets in hot water with Lowe’s vagrant husband. Through it all he returns to the ranch and watches over Johnny who has been made a blood brother to the Apache. His relationship with Angie deepens and when all seems to be lost during an Apache ambush, he breaks up their wagon circle and kills the enemies leader allowing them to flee. Hondo has a happy family life ahead of him, but it is pretty evident that the Apache existence will die out soon with the arrival of still more Cavalry forces. This entry was posted in 1950s, Western and tagged James Arness, John Wayne, Ward Bond by 4StarFilmFan. Bookmark the permalink.